After a recent communication from google where they indicated a problem on my adsense account, it appears there *may*, and I repeat MAY in my opinion (and that of others on the net by the looks of it) be a problem with using blog traffic exchange sites (not lsblogs, but blog traffic exchange sites) if you use adsense. Now as I dont click my own ads, or offer incentives, nor pay people to click then the only thing left is traffic exchanges targetted to blogs, it appears this may be where the problem lies. I asked them specifically if it was, but they wont tell me if it is, I guess they think people are capable of reading there minds. I am writing to let you know that you should review your adsense policies, if you are using adsense on your blog and also a member of blog traffic sites. As far as I know I was not aware there was any problem, and cannot yet get google to comment on this matter. Hopefully in time, we will find out the true situation, but if anyone else gets problems like this, I would appreciate it if you post in the forum so we can see the extent of the issue. I cant see why google should have a problem, as any traffic on a blog exchange is targetted, but time will tell. In the meantime, I have disabled my blogs on the exchange I normally use to avoid further problems with google. If anyone out there finds out more information, please let us know! Found this today, whilst watching the feeds being updated..
Google already has it’s Google Analytics service, but now it has a one specific to bloggers. data in a easier to understand format for bloggers. Many bloggers use adsense, those little google ads on their blogs. For those of you that use them, you may be aware that the summary page does not include a “all time” option, you can only view today, yesterday, last 7 days, last month and this month. The only way to see your full earnings for all time, is to go to the advanced reports page and view it. This can be a pain, especially if you have used adsense for a long time, as the all time report can be HUGE! Another problem, with not having a all time option on the summary reports is you cant see your referall stats for a period longer than 1 month - and also that information is not shown on the advanced report, so you have no idea how many referalls and conversions you have in total…. Well, if you use this little trick below, you can have a all time option, and see this information. Its quite handy, and very easy to do. scrolling down a long, long report on the advanced page, and will save google some bandwidth in the process! Obviously, you use this at your own risk! Personally I can’t see any harm in using it, as it is just showing you your stats..
Its not trying to cheat the system in any way, and I cant see any rules against it in the terms and conditions, but Im not a lawyer, so you need to decide for yourself. 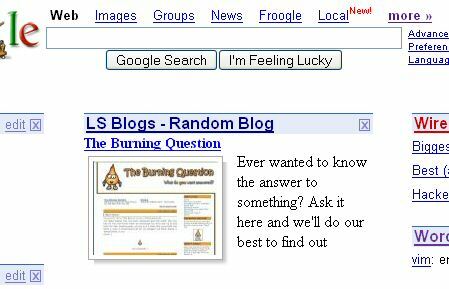 Add LS Blogs to your personalised google homepage. Many of you may be aware that you can personalise (I spell it with a S as I am English, in case any americans were wondering) your google homepage. I have added a module that you can add to your google homepage, should you wish to do so, that displays a random blog from the LS Blogs blog directory each time the page is shown. You can personalise your homepage by visiting google.com/ig and select from the standard modules which ones you want, or you can add one of the many custom modules. and hit the go button. It is my first module, and if it proves popular, I may expand its features, and add more modules in the future. Hope you like it, if you do, feel free to blog about it so others know, after all if your blog is listed in the directory, your blog could be the one that pops up randomly on someone elses google home page. Note, blogs in the adult category are not shown by the random blog module, only the blogs in the non-adult categories. which has a great selection of tools and blog related sites, I spotted something interesting. UrlTrends is a site that lets you get a whole host of information about your site, and how it is fairing in the major search engines. One thing that caught my eye, was it didnt just show the current status of the site, it showed graphs over a period of time. Now, its highly likely that many sites may not have been monitored previously by the site, so not everyone will get a history showing, but for those that do, its quite interesting to view. Another useful feature, is the ability to compare trends for several sites, so if you want to see how your site fares against another, you can do so easily. Im actually writing these posts using a nifty tool called Performancing for Firefox. Basically, its like having a word processor in your browser, that integrates directly with your blog. It works, and it works very well - very impresssive, and something I can see myself using for quite some time to come. I highly recommend a look, its well worth a visit…………. Button Maker - the new featured site. At present, the featured blog / site on LS Blogs, isnt a blog, but a tool that is useful to many bloggers out there in the blogosphere. You have problably seen many blogs with those dinky little buttons on, such as the listed in lsblogs button. They are not everyone’s cup of tea, but many people love them. Until now, the only way to get a button, was to either use an official one, or learn how to use a graphics package. The button maker is a simple to use tool, that lets you create those dinky little buttons without messing around with a graphics package. The official Enhanced Website Button Maker button. A website button for the website statistics script, PHPCounter. A button for linking to your RSS syndication feed. A button for showing that your RSS is valid. A button for showing that your CSS is validated. A button for showing that your XHTML is validated. View this sites more details page.